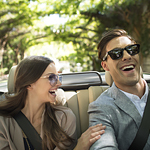 Your road trip can be a fun adventure and one that is safe if you follow a few tips. Take your vehicle to Galpin Volvo to have a tune-up performed. The mechanic can change your oil and spark plugs and make sure everything is ready for you to drive an extended distance. Your battery, belts, and tires should be checked as well. While you're driving around town, you might discover that there are laws against using your phone. Put your phone in the glovebox or in another location so that you're not tempted to use it while driving, taking away a distraction that could lead to an accident occurring. If you need your phone for a map, then let someone else in the car hold it and give you the information. If you're driving at night to reach your destination or you want to see different views of the towns you plan to drive through, then you need to rest during the day so that you'll be alert behind the wheel. Check all of the lights on your vehicle to ensure that they are bright enough to see the road in front of you and so that other drivers can see your vehicle.